Over two years ago we welcomed Nemo into the family, and then Goldie. They were goldfish that lived in James' room, and neither lived very long. I got tired of flushing James' pets, so I banned fish for a couple of years. Yesterday, the ban was lifted, and Charlie came home. This time, we went with a more durable Siamese fighting fish, often referred to simply as a betta fish. Here's hoping Charlie the Siamese fighting fish outlives Nemo and Goldie. It's a fish murderer's third chance. Can i give you a suggestion? 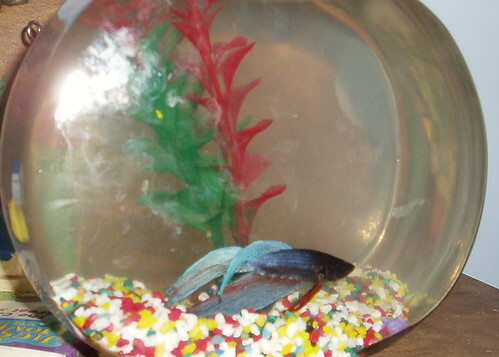 Ive never personally used a fishbowl before, so i dont know if this is what is causing your fishes deaths. Temperature and oxygen levels are important, thats why theres always a small pump in fishtanks. just an opinion. Apparently these betta fish don't need a pump. With the previous gold fish, we had a tank and filter and all that jazz.